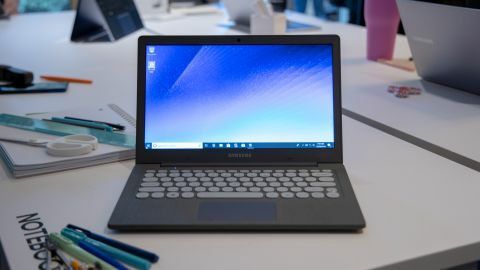 Chromebooks have been the budget laptop to beat for too long now, so Samsung hopes to start the coup with its new Notebook Flash running Windows 10, debuting at CES 2019. This 13-inch laptop brings some seriously luxe features to an affordable price point. From an included fingerprint reader to the 13.3-inch Full HD display and its unique look, the Samsung Notebook Flash is the most intriguing budget-priced laptop we’ve come across since the Microsoft Surface Go. Being a budget-priced laptop, Samsung is calling for $349 (about £274, AU$489) starting price to grab a Notebook Flash when it launches on January 15 in the US on Amazon and Samsung’s online store. Samsung has yet to disclose UK and Australia pricing and availability. This price nets you an Intel Celeron N4000 processor – found in many Chromebooks and budget Windows laptops – backed by 4GB of memory and a 64GB eMMC flash drive. If you want a little more power, you can cough up $399 (about £313, AU$559) for a punchier Intel Pentium Silver N5000, which is in a similar class to the Pentium Gold within the Microsoft Surface Go. Both options feature a 13.3-inch Full HD (1,920 x 1,080) display with an anti-glare coating and an absolute bevy of ports given its size and price: two USB-C 3.1, one USB 3.0, one USB 2.0, one HDMI, a 3.5mm headphone jack and a UFS-MicroSD card combo slot. But, that’s not all. Both versions of this laptop feature a fingerprint reader as well – a rarity at this price point. All of this should make the Samsung Notebook Flash extremely competitive in the budget laptop space against Windows laptops and Chromebooks alike. Again, being a budget laptop, the Samsung Notebook Flash look and feel isn’t going to wow you. However, we find it to be perfectly suitable for the price point and target audience. The laptop comes wrapped in a charcoal gray plastic shell that looks relatively normal on the screen lid. However, open up this bad boy and you’ll see a different finish entirely. While it looks and feels like a textile pattern, we’re told it’s still plastic under there. Resting our palms on the laptop’s keyboard deck feels more like uneven concrete or a popcorn ceiling. It’s definitely different from the other alternative materials we’ve tests, like Microsoft’s Alcantara fabric, if not quite as comfortable. Another oddity about the Samsung Notebook Flash is its keyboard specifically. You see, the keys take on a traditional typewriter style, being completely circular and well-spaced. We’re honestly not all that tickled by the novelty, but younger folks (and hipsters) might dig it. Otherwise, this is a fine-feeling keyboard and touchpad, the latter of which is plenty spacious for a laptop of this size. We have to commend Samsung for its fingerprint reader placement on the keyboard, too, just above the right arrow key that would otherwise be empty or a massive shift key. It’s tough to discuss how the laptop performs without a full suite of benchmarks, but it would be safe to expect a power profile similar to the Microsoft Surface Go. With that in mind, expect just enough oomph to get through general computing and maybe the odd casual game. The 64GB of storage isn’t all that much, but it’s double what most Chromebooks offer at this price range. Just be prepared to supplement that via SD card or cloud storage services. Samsung promises up to 10 hours of battery life from the Notebook Flash, and honestly, we wouldn’t accept anything less given it’s become the standard for most Chromebooks. All told, the Samsung Notebook Flash should prove to be a fine laptop for students and budget-conscious consumers alike. With plenty of features not often found in laptops at this price and an attractive design, we don’t have any bugbears with this one at first glance. The strange-feeling textured keyboard deck and completely circular keys might throw some off, but we’re all for new spins on old technology if only for something different. Chromebooks have ruled the roost when it comes to cheap laptops for some time now. The Samsung Notebook Flash could be the laptop to turn the tide.